Voter Fraud ON TV??? OH HORRORS! Call The Feds! Call Out The National Guard! | HAIL DUBYUS! Voter Fraud ON TV??? OH HORRORS! Call The Feds! Call Out The National Guard! How can the American public stand for such a thing. It demeans the experience of this great family entertainment. J’accuse! J’accuse! 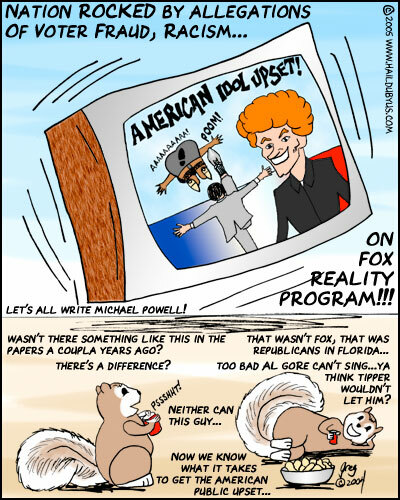 I call upon all watchers of “American Idol” to email Michael Powell, Chairman, Federal Communications Commission to complain about this hypocrisy…MWAHAHAHAHAHAHAHAHA!